I’ve been paddling down to watch the 2 young Bald Eagles since June. Up until yesterday I always found them high in white pines within sight of their nest. 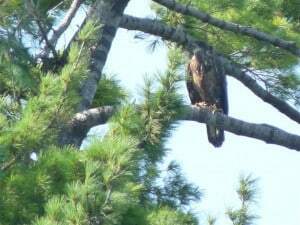 August 17th was the first day they ventured farther, to a heron nest about a mile from the eagle nest. (Herons left it weeks ago.) We sometimes spot the adult Bald Eagle, sometimes near the young, often not. I’ve been reporting to eBird faithfully. Note: Click here for an eBird bar chart of bird abundance (all species/month-by-month) in Peterborough County for the past 10 years. D.M.